Let's welcome the New Year with a sigh of relief -- and the hope of relief. As the Herald took a look back at 2009, it was tough to get beyond the grim grip our economy has had on just about everything. Unemployment. Foreclosures. Bank failures. Chinese drywall. And a record year for homicides. C'mon, where's the glass half full? I'd love to say we think 2010 is the answer to all our woes. Most seem to think our challenges will linger, to say the least. But hope lives eternal. Let's hang the new calendar on the wall, wish 2009 good riddance -- and wish each other a HAPPY NEW YEAR!! On Christmas Eve, the mood in our community seems promisingly hopeful. The Herald newsroom has been deluged with callers telling us about how they are helping others. We're blessed with having more stories than we can write. But there's a great sampling in today's edition, and more on the way through the holiday weekend. Volunteering seems to be at an all-time high -- the demand is certainly there. And just about everyone at the Herald has pitched in somewhere. Business Editor Jennifer Rich sets a high bar for the rest of us. Every week, she teams up with senior citizens at Meals on Wheels Plus's Adult Day Center. She went this week, decked in holiday finest, bringing friendship and comfort. She acknowledged that it's not always easy -- she gets attached to someone, only to find them gone the next visit. But there is always someone waiting for her company. If you can volunteer, call 941-748-3001. Reporter Richard Dymond wrote today of the preparations for Christmas Day feedings for the homeless and needy. So many more are on the receiving end this year. For those of us lucky enough to have a job and loved ones, let's ante up to Jennifer's challenge. My sports staff -- all of a dedicated three right now -- just pulled off a really amazing week. Sure, they had plenty of help from the rest of the newsroom. But Sports Editor Alan Bellittera and sports writers John Lembo and Ryan Boyd deserve a standing ovation. -- The Lincoln Memorial High School 40th reunion, centered around the historic sports teams of its years. Ryan led the coverage. -- The Pittsburgh Pirates picked last week to unveil the identity of our town's new minor league team: the Bradenton Marauders. Ryan led the coverage. -- The Herald produced its annual Golf Guide, published on Friday. Alan came in before and stayed after producing the daily sports section to work on that. -- And the Manatee 'Canes went on the Road to Orlando. Guess who? John, Ryan and Alan, with a major assist from Vin Mannix, led the coverage. They had stories for 1A and Sports every day last week. They followed the 'Canes to Orlando, blogging through the awful first half, then the promising second half, and then turned stories after the "Oh,So Close" finish. They got back around 2 a.m. Saturday. Yesterday afternoon, a bleary-eyed Lembo was at it again, writing this story for the wrapup. And at 7:24 p.m., he was still emailing in results from the Sarasota Wrestling Classic, with Braden River's Trevor Barnes leading his team to tie for second. And Alan was on the receiving end to make sure the results were published. I'm glad we're on the same team. This week has brought something truly remarkable to the city of Palmetto and our community: the Lincoln Memorial High School Grand Reunion, marking the 40th anniversary of its last year in our community. It officially began Wednesday, with a symbolic walk through "the Tunnel," the chute under U.S. 41 through which coach Eddie Shannon’s Lincoln Trojans charged into history, as Vin Mannix wrote in today's Bradenton Herald. At a time when racism was accepted, the black community remained united and firm in faith, with Lincoln Memorial its centrifical force. Hundreds of alumni are joining the festivities this week, which include pep rallies, social gatherings, fish fry, banquet and dance, church service and the debut of a documentary filmed by Manatee Educational Television. The planning and reminiscing started months ago, much of it captured in our expanded Sunday coverage led by Ryan Boyd. Although he is far too young to have first-hand knowledge of Lincoln Memorial, Ryan grew up in Palmetto and was teethed on its legends. He captured much of that in this feature and in his column , as did Vin in his Sunday column. Although sports were a major part of Lincoln, and discipline played a role in all of the schools that I attended in Manatee County, the most important and positive piece of the legacy of Lincoln Memorial High School was not mentioned (my opinion). The missing piece is the education of students at LincMeHi. It would be wonderful to read of the accomplishments of Lincoln Memorial graduates in business, education, government, etc. All was not perfect education wise; however, many graduates went on to achieve on many levels and not all as a result of higher education. I can think of a few professions of Lincoln Memorial graduates: teachers, professors, engineers, registered and practical nurses, physicians, dentists, lawyers and on and on. This is what should be celebrated!!!! AND, let's not forget about the Lincoln Memorial High School Band under the direction of Norman Middleton (during my time there)!!!!! After I graduated from Lincoln Memorial I attended Florida A&M University for one year; segregation was still a factor. I later moved to Rochester, NY and now have a Bachelor of Science degree, nursing as major from the University of Rochester and a Master of Management degree from Brandeis University in Massachusetts; both well-respected educational institutions. My major career positions were in public health and home health where I progressed to a management level. I was also a nursing faculty member at several colleges in the Rochester area and in Massachusetts. That is a long way for a young black woman from Rubonia, whose aunt (R.C. Washington) drove her to kindergarten at Memorial Elementary School because Rubonia Elementary did not have kindergarten. Rubonia Elementary and Lincoln Memorial teachers taught academics as well as social graces, diplomacy, and other areas not normally learned at educational institutions; Florida A&M taught the same as well. So please, speak with graduates of Lincoln Memorial to find out what they are doing today and how they have made positive contributions to the county, country and the world; and of course, write about them. 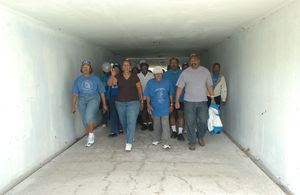 Lincoln High School alumni walked through the tunnel Wednesday, singing the school alma mater. Manatee Hurricanes ARE No. 1 today where it matters -- here at home. And what a fantastic victory. Everyone either is talking about being at the best game they've ever seen, or wishing they had been there (darn it, I'm the latter). As Vin Mannix captures in today's story, it was a stirring triumph Friday night over St. Thomas Aquinas. And it was here at home that the Canes beat the former top high school team in the nation. As John Lembo wrote Friday night after the big game, Manatee shocks nation's No. 1 team. What better way to put us on the map! You'll find more coverage here at Bradenton.com/sports and throughout the week as our team prepares for the trip to Orlando next Friday, where we hope they'll claim the state championship over Tampa Plant at the Citrus Bowl. Everyone is talking about the Canes -- even Six String Sanctuary, a fantastic music blog by our former ME (and former co-author of this blog) Jim Smith, weighing in from Milwaukee). His headline? Manatee magic is music to my ears. That's a tune we love. This one's too precious to resist -- and we need a bit more disclosure as well. A story last week by Vin Mannix on Peachey, a dog viciously attacked by a coyote, might have been the most talked-about for days. It was viewed more than 8,000 times the first day online. But the most touching reaction came from All God's Children Preschool, where Aubrey Sherrill is a student. And Peachey is her puppy. 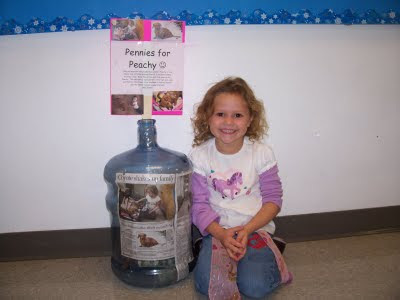 We would be happy to be the collection address or collection drop off if people in the community would like to help Peachy too." I talked with Crystal this morning, and she said people are dropping off donations every day. They've even got donations by mail. "The kids know they're doing something really wonderful," she said. "And they are so excited -- Peachey is coming in Friday for a visit." As Danica said in her email, "Thank you so much I just cannot believe how many angels there out there that care." Need a little hope this morning? I know I sure do. Well, we're finding that it's pretty easy to find a lot of people in our community who are giving that gift of hope. So we've started a series of stories in this holiday season to share some of these amazing efforts with our readers. Our hope: that it will stir others to give. Reporter Timothy Wolfrum has had several stories already, including today's 1A feature on a Palmetto couple with an unusual twist on hunting. Gary Plum and his 14-year-old son are avid hunters. So Missy Plum, mom-wife-accountant, came up with their Gift of Hope: a local chapter of Farmers and Hunters Feeding the Hungry, a national outreach program that seeks donations of venison and other big-game meat for food banks and other charitable organizations. If you have a story to share, please leave a comment or email me at jkrauter@bradenton.com. I had a pleasant surprise this morning -- the Traveling Twins paid me a visit at the Herald. And they are just as energetic and engaging as they sound in their blog. We realized that even though we've been in almost constant touch since they started blogging for us months ago, we had never actually met. But as I said in introducing them to you back in March, Mary Bender and Martha Jansen are definitely 70 years young. When they started blogging for the Herald, they were traveling through Europe for their birthday. Since then, Martha has journaled in her Armchair Travel blog about other fantastic trips enjoyed by friends and family. In the 20 minutes they spent here today, I heard about past and future travel plans that made me want to pack my bag to join them. The next adventure: Martha's journals from Ireland. And she also plans some whirlwind trips through Spain and Italy in 2010. Stay tuned in the weeks ahead.